With the never-ending churn of political machinations within the nation’s capital (to say nothing about the repetitive monotony of it all), drinking is almost a contact sport in the District of Columbia, from lobbyists blowing their expense accounts at Jack Rose Dining Saloon, which boasts the largest collection of rare whiskey and bourbons in the States, to commiserating rail shots fueling legions of Capital Hill interns. But surprisingly, DC didn’t have a bona fide hometown distiller until 2011. George Washington might’ve been distilling booze in Mount Vernon, VA. But that’s on the other side of the Potomac River, and the city lacked a dedicated resource for home-grown alcohol until New District Distillers decided to occupy a 90-year-old warehouse near the Art Deco landmark Hecht Co. warehouse in the mostly-abandoned neighborhood of Ivy City and start producing their truly amazing Green Hat Gin. Since those pioneer days, distilling has exploded across city, with spirits that range from vodka and gin to rum, amaro, and whiskey. One cold day in February I visited three of DC’s distilleries—chosen by my father as part of a holiday present to me and my brother-in-law—and though he based his selection of establishments based on whether or not they took reservations (which can obviously simplify the logistics), the picks offered a perfect snapshot of where DC is—and where it’s going—in the exponentially-expanding distilling landscape. One of the newer establishments to DC, District Distilling opened three years ago—and quickly and successfully lobbied to change the city’s liquor laws, a decision that has since benefited all the other distilleries: now all distilleries are permitted to have an open bar on-site. But in no way was this spot an off-handed “see if it’ll work” venture. Its new space occupies converted three row houses in the U Street Corridor neighborhood, just west of 14th Street, a neighborhood where one row house commands prices well over $1 million. Not only did they gut those three houses, knocking down walls to create an impressive footprint throughout its maze-like floor plan. They also custom-ordered distilling equipment from Germany to fit this converted space and sourced an experience distiller to get the operation up and running. And their distribution is equally ambitious, with product in the DC area as well as California, Pennsylvania, and the UK. No doubt both the bar and the soon-to-open third-floor restaurant will benefit from all the foot traffic, but their products are high-quality enough to justify a visit. As with most distillers in DC, District Distilling is too young to have produced and aged whiskey on-site. Instead, they craft the base spirit here, add them to barrels with a medium char from Kentucky and ship them to Wyoming to be aged; the whiskey they sell now, including two whiskeys and a rye, are crafted from gray-market bourbon. Despite those logistics, they still hand-bottle each batch, four at a time, one pallet an hour. Those dark spirits join a host of others in semi-regular rotation, including two rums, multiple gins, a vodka, and a grappa. Their Corridor Vodka, distilled 42 times and rested in stainless steel at temps down to 42 degrees, lives up to its marketing as a “whiskey-drinker’s vodka.” The amount of rye (80%, along with 20% barley) exceeds the amount found in their aged rye, and delivers spicy notes seldom associated with a clear spirit. And their Buzzard Point Rum also leans into spices rather than sweetness, reminiscent of more flavor-forward rums found in the Caribbean. The Checkerbark Barrel-Aged Gin also won praise. It rests on new oak and used bourbon barrels on-site for 10 months, and stands proud alongside their vodka as a whiskey-drinker’s gateway into the juniper-forward spirit. But the clear winner that day was their Wild June Gin, a Western-style spirit made with wild-foraged red berry junipers from the West Texas Mountains that won the Gold Medal at the 2018 San Francisco World Spirits Competition. Tours cost $10 and run hourly starting at 4 on weekdays, and noon on Saturdays—the price of admission gets you a tour and tastes of at least four spirits. 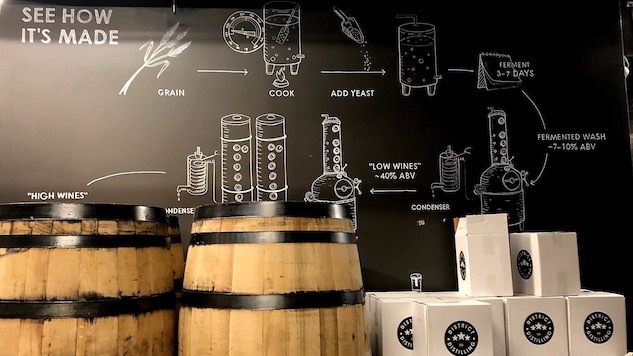 Unlike District Distilling, who wiggled themselves into an already crowded part of the city, Republic Restoratives followed the path of Green Hat Gin’s New District Distillers by taking full advantage of the available warehouse space in Ivy City. Occupying one corner of traffic-dense New York Avenue, the place boasts a vibrant front room bar/tasting room that was positively buzzing on a random Saturday afternoon, along with loads of space for distilling, barrel-aging, and the other mad crafts of spirit-making, spread across two warehouse floors. The small-batch operation was founded by two women, life-long friends that utilized crowd funding in 2015 to source their investment; they doubled the initial ask for $60,000. As with other young distilleries, they buy third-party whiskey wholesale and put their own spin on the spirit via various aging processes, which takes place in the second-floor barrel room. On-site, the base alcohol that will later be released as on-site bourbons and whiskeys is derived of 100% corn is filtered through desiccated coconuts 24 hours a day, seven days a week to achieve the desired purity. They first released their Civic Vodka, followed by a host of others including a strikingly good apple brandy, the Borough Bourbon, and the Rodham Rye, a blend of whiskeys that delivers a surprisingly smooth, almost buttery finish atypical to the style. It should be noted that the spirit got its name in 2016, long before Trump won, and a portion of proceeds goes towards recruiting and training more women to run for office. This reinforces the owners’ commitment to giving back, and in many ways Republic Restoratives feels like a DIY project gone right; they work regularly with other distillers to learn the craft and host an incubator kitchen on part of their property. Even their logo nods to the local community. At first glance it appears like hand displaying crossed fingers, but the symbol is actually the sign for the letter “R” in honor of nearby Gallaudet, a federally chartered private university for the education of the deaf and hard of hearing. Tours here run $12, and includes tasting of each spirit as well as a commemorative glass. If District Distilling seems focused on drafting off the nightlife in an already thriving neighborhood and Republic Restorative feels like artists in love with all things distilling, then One Eight Distilling feels focused first and foremost on distribution. Admittedly, right now you can only find their booze in DC and Maryland, but their warehouse space, also located in Ivy City an easy walk from Republic Restoratives, speaks to their greater ambitions. It includes 1,800 square feet for distilling, bottling, and barrel-aging in as much as 1,700 vessels, alongside a front bar that carries a convivial barn house vibe. It was founded in 2014, and is named after Article One, Section Eight of the Constitution, which mandated the creation of a federal city. All the ingredients are sourced from within 100 miles, tapping into the bounty of farmlands in Virginia and Maryland, as well as the surprisingly spirit-friendly DC tap water. Two years after they opened, they shifted their handful of releases (including the Ivy City Gin and Rock Creek Whiskey) under one over-arching brand, dubbed “District Made,” and the label and bottle carries all kinds of DC-centric Easter eggs, from the octagonal shape of the bottle to the diamond cut-out on the front label that reveals a gold map of the District on the side. They still call their gin Ivy City, in an affectionate reference to their home ‘hood, and vapor-distill the spirit with a laundry list of botanicals that include Appalachian all spice, lemongrass, lemon peel, fennel, and a whole mess of rye (62%) that denotes a bit of spice. Its District-Made Bourbon Whiskey comes from an heirloom corn varietal and was the first bourbon to be made “from grain to glass” in DC since Prohibition, bottled at a robust 95 proof. Both were grand, but my memory shifts back to the tastes from their Untitled series, small-batch releases that lean on the playful and unexpected. On hand that day, their No. 11 Whiskey was the clear winner. The blend of bourbons was finished in a combo of Cognac, Ruby Port, and Pedro Ximenez and Oloroso sherry casks that created a spirit that was so delightful and complex, I was tempted to not add so much as a single drop of water (though when I did, it opened the flavors up quite nicely). One Eight also offered the best value for the price of the $16.50 tour; in addition to the samplings, you also got a free cocktail at the front bar/tasting room as well as $10 off any bottle.